T100TA record an audio stream - how? Thread: T100TA record an audio stream - how? I am trying to activate 'Stereomix' or similar recording feature on T100ta soundcard (Realtec and Intel Drivers). Purpose: To record Audio streams from YouTube or similar Internet Playback Sites (particularly Midi, using Sibelius Scorch). Is this at all possible on the T100TA? If yes, how? It does record an Audio stream playing from built in loudspeakers with the microphone, but this takes all Background noise too. Hi, I have the exact same issue. I'm a music teacher and musician and bought the t100ta for the sole purpose of having a portable Windows device that runs my PC audio softwares. I never thought grabbing snippets of music I need to learn or compare lessons to for reference was going to be an issue. At this point I'm at a loss and need the Stereo Mix or some type of "record what you hear" application. In other newer laptops I've to go to the "recording devices" window and right click to select "show disabled devices" and then I'd see Stereo Mix. But I haven't had luck doing this on the T100ta. But try it if you haven't yet, you might have better luck...if so, please let me know so I know there is hope. I contacted Asus about the missing Stereo Mix and they were no help and only threw drivers are the issue. I currently have an email into Realtek to see if they have a clue, but I haven't heard back and had to send a couple of "hey, any idea?" follow up emails. If I hear something I'll post it here for sure. I have a couple of workarounds I can share but due to Win 8.1 and newer broswer versions it can still very challenging and would be SO MUCH quicker if I could just record what's playing through my soundcard. One workaround is, use Firefox with the Video Downloadhelper add-on. You can download a copy of the FLV file and then convert it to MP3 and load it into your program. This works about 60% of the time and of course there is download time to account for, for me during a lesson where I want about 10 seconds of a clip the download time can be a real hassle. I think there are also compatibility issues due to the browser version being the latest greatest and in turn making the user the guinea pig. A second method is using youtube-mp3 website it allows you to paste in a youtube URL, convert it to mp3, and then download it. The conversion is pretty quick and but it still takes time to download. Again, 99% of the time I need about a 10 second snippet and not a whole tune. But, this site is pretty solid and works on the files that downloadhelper has issues with. Hopefully someone will have an answer...I'm just about to return the T100ta and just get a Surface or something but who knows if I'd run into the same thing. @ gennation... Welcome to the forums. I haven't a clue for solving your problem but it's very interesting to read how different folks (try to) use their T100s outside of general everyday stuff... email, browsing, facebook, youtube, Widi streaming, Office and other more mainstream things. Thanks for the welcome Rick. I was surprised to finally find someone like Lugwig1954 having the same needs and issues. I've been doing computer and network engineering for over two decades now and can usually piece some working solution together, but this one has been one dead end after another for about three weeks now. Audacity may be worth a try. Have you tried a Google Search for "Windows 8.1 stereomix" -- Found several links. It does look like it might be a driver problem - there are some suggestions on the Microsoft Support pages. The realtek I2S codec that bay trail devices are using does not expose stereo mix functionality. It looks to me like this is intentional, and I'm not so sure microsoft's forums would help. If I read correctly, it seems you want to redirect audio output as audio input - with the end goal being recording all system sounds. You absolutely do not need stereo mix to do this. In fact there are simple solutions for this problem. 1.) Audacity (free, open source) allows you to record speaker output and export the result digitally. You can record, edit, & export in the same interface. 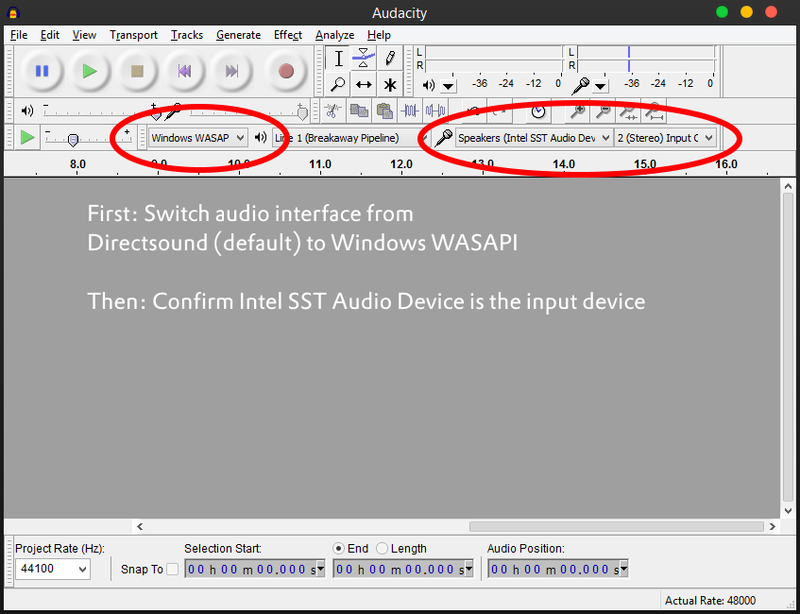 In the audacity main window, change your audio interface to WASAPI like so (Screenshot). 2.) You may not like audacity and prefer functionality similar to stereo mix. VB-Cable (free, donations accepted) allows you to do this. You now have "CABLE Input" and "CABLE Output" in your playback & recording devices panel. Whatever goes into Cable Input comes out at Cable Output, so set both as your default playback/recording devices and you basically have stereo mix. I haven't tested this software so I'm not sure if audio will pass through to the speakers. Others have reported success with this software. Let me know how it goes. 3.) For some reason neither audacity nor VB-Cable are right for you. Virtual Audio Cable (license required, trial available) is a bit more sophisticated. I have an older version of this software installed on my other computer and it works brilliantly but I wont go through the setup unless someone asks. Fun fact: VAC is bundled with breakaway audio enhancer which extremely nice to have if you listen to music often. Thanks for all the suggestions. I've tried a lot of these search strings and audacity, as well as the "virtual audio in/cable" programs and just can't get over the hump on it. But, I will continue down the path of checking each of these suggestions even if it's a duplicate attempt just in case I missed something. The issue seems pretty wide spread. I also have a Dell laptop running Win 7 and that was the first time I ran into it but the "show disabled devices" thing worked in that case. But not this case. 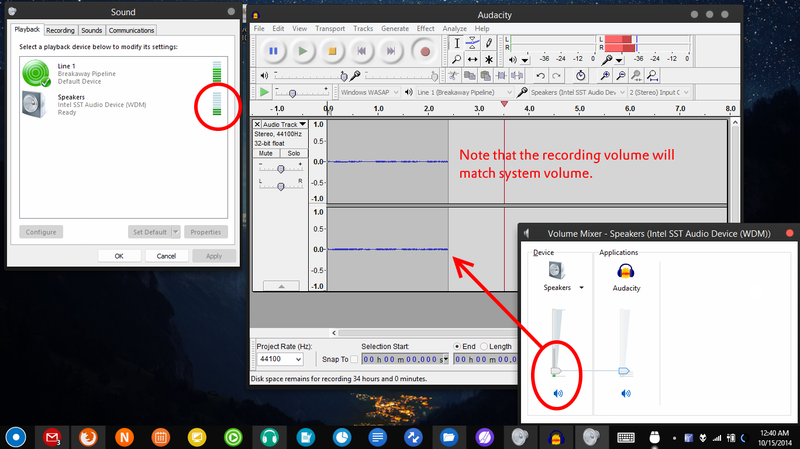 If you right click the little speaker icon in the systray, (normally) in the lower right hand corner of your taskbar, and select "Recording Devices", in the popup do you see the Stereo Mix device? If not, right click in the empty area/field in that window and select "show disabled devices" and "show disconnected devices". Do you see it now? On my Windows 7 PC, yes I do. On my Asus ME400C (non keyboard sister of the T100), no I don't. Last edited by rickscheller; 10-16-2014 at 04:29 AM. I'll check my T100 later today when I get a chance and let you know. Doing and A/B between the Win7 Dell and Win8.1 Asus I see the Dell has an actual Realtek Audio Service running in services and the Asus doesn't. All of the audio devices available on the Asus are labeled as Intel SST Audio Device and the Dell are all Realtek devices. The Windows Audio and Audio Endpoint services control whether there are any audio services. I can toggle these services on and off and see the audio devices come and go. I have a feeling that the Realtek driver I'm loading is installed but it can't be loaded in services or something to that effect. Would case for Asus Transformer T100TA fit a T100TA-H2-GR w/ 500GB HD? Can the prime record audio while using Super Pad?